Today we are going to take a look at another type of “hidden gift.” We previously looked at hidden gifts involved in transactions with a Texas nursing home Medicaid applicant’s homestead or house. Today we are going to look at transactions involving a Medicaid applicant’s car or vehicle. For those of you visiting us for the first time, I use the term “hidden gift” to refer to transactions which may not appear like a gift that creates a Texas nursing home Medicaid penalty because of some technicality, when the reality is the HHSC looks past the technicalities and discovers these attempts at hiding a transfer of assets. And once discovered, a costly penalty can follow. When your parent applies for nursing home Medicaid in Houston or anywhere in Texas, the past five years of their financial transactions are subject to review. If during those last five years, your parent purchased a car or vehicle and put anybody else’s name on the title to the vehicle other than their spouse you may have a Medicaid gift penalty to deal with. You may be surprised at that because after all, the Medicaid applicant is still an owner of the vehicle so how can it be a transfer that creates a Medicaid penalty? It is correct that the Medicaid applicant is still an owner, but they are not the only owner and that is the reasoning for the HHSC to impose a Medicaid penalty. In order to determine the value of the transfer, the HHSC regulations provide that if a nursing home Medicaid applicant paid for a vehicle and titles ownership to the vehicle in his/her name and someone else’s name then the entire purchase price is a transfer of assets for Medicaid eligibility and will result in a penalty period based on the full purchase price. So if your parent paid $25,000 to buy a vehicle that has both of your names on it, the HHSC says your parent made a gift of $25,000. This gift will result in Medicaid ineligibility for more than 6 months (using today’s figures) that you will have to find another way to pay the nursing home bill. The outcome is a little bit different if your parent only contributed a portion of the purchase price of the vehicle. Let’s say you paid $5,000 towards the purchase price of the vehicle and your parent paid $10,000 towards the purchase price of the vehicle that is in both of your names. In that scenario, the HHSC says the amount of the transfer is $10,000. This would result in over 2 months of Medicaid ineligibility (based on today’s figures) where you would need another plan to pay the nursing home bill. Today’s lesson is to remember the consequences of using a parent’s funds to purchase a vehicle that is titled in the name of anyone except your parent’s name alone. You may not realize it at first, but a seemingly harmless transaction at the time can cause significant problems when applying for nursing home Medicaid in the next 5 years. Want To Learn Medicaid Secrets? I’d like to know from you: are you interested in learning Medicaid secrets that can help you protect assets and get through the government red tape? Have you been looking for answers and just can’t find anything you can use? Let me know your thoughts on this by leaving a comment below. I do read them all. And of course, if there are other topics you think I should discuss , please let me know! Hi, thank you for this article. I am not in TX, but I have a question. Is TX that considered the amount of contribution when determining the share of ownership??? This article seems to suggest that it doesn’t. Here is a quote from the HHSC on how they handle jointly owned vehicles purchased with a Medicaid applicant’s funds. When someone uses an applicant’s money to purchase a vehicle, and the title is placed in both the applicant’s name and the other person’s name, consider the entire purchase price of the vehicle as a transfer, because when the applicant’s money was used to purchase a vehicle with the applicant and the other person as owners, the applicant’s ownership or control of the asset was reduced or limited. Joint ownership of a vehicle is survivorship, not tenants in common. So there is no need to determine the share of ownership, the entire amount of the Medicaid applicant’s funds is subject to penalty. Thank you again for the fast response. Please allow me to ask one more question. If the co-owned car is the only car that the Medicaid applicant has, would be considered exempt asset (which should be non-countable) or a gift (which can cause a period of ineligibility)? In Texas, be prepared for gift treatment. The vehicle would be exempt if solely owned by the Medicaid applicant. The fact that the applicant still owns some interest in the asset does not negate the previous gift because they still own less than 100%. I would tackle this from a different angle. What is the need for the title to be joint? If it is solely for asset protection reasons, there are simpler options in Texas that do not trigger the complications a joint vehicle title brings. If the vehicle is in his name alone and he pays fair market value for the vehicle I do not see a penalty issue there right now, however I can’t say definitively without having all the facts. The HHSC has been getting a little more aggressive on expenditures and purchases which the person never benefits from so that could change in the future. If he pays more than fair market value or the vehicle has someone else’s name on the title as well as his, then you are running into penalty scenarios. Preserve your evidence in case you need it during the Medicaid application later. What if the medicaid recipient wins a car and pays to upgrade it and he and the spouse already own cars will this affect their medicaid renewal? A third vehicle is certainly going to be part of the asset evaluation for a renewal. You can always exclude 1 car, sometimes 2 in specific scenarios, but the regulations have no provision to exclude a third car. What the impact will be depends on their SPRA and their other assets. You should review the situation with the attorney who handled the initial application. Depending on the details of the title and his benefit case a transfer of the vehicle is likely to raise Medicaid transfer issues. The attorney who handled his application should have addressed the best way to preserve flexibility in transferring title. I suggest having someone review the details of the current situation to evaluate any remaining options, but at this late stage some options he previously had may no longer exist. For example, if I was providing representation in this case earlier I could have created a path to complete the transfer without a penalty, but the specific strategy I have in mind disappeared with his wife’s death. My mother recently experienced an accident that resulted in a traumatic brain injury. Her husband, my step-father, left her a few months after the accident, stating that it was more than he could handle. She had just gotten out of a nursing home facility and transferred home, along with home health care. They had just bought a new car, however, not the best one in my opinion as it is a car and not a smaller sized SUV that she could easily get in. Now that he has divorced her I see no other option than to place her in a nursing home, as I cannot stay with her. 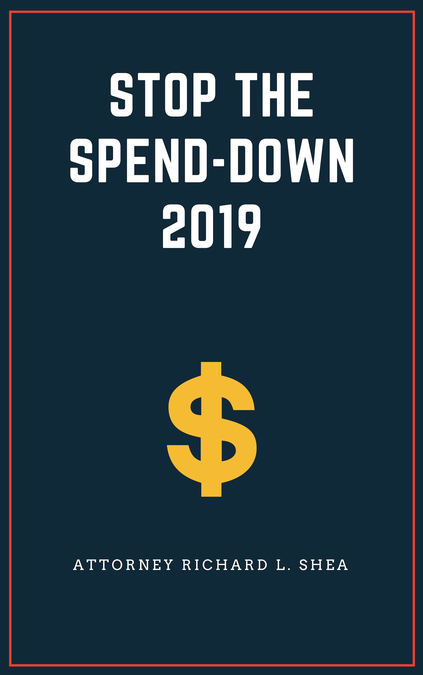 My question is, in order to “spend down” a rather large nest egg would it be permissible for me to purchase a midsize SUV in order to transfer her to the countless medical appointments she now has. I just feel that this would be much easier for her to step into and out of than her current car, again which was recently purchased with a fair trade price of roughly 22K. The vehicle would remain in her name only, so I might need to consider talking to her insurance agent about coverage while I am driving it. There are usually better alternatives than vehicles purchases in most cases I work on. Without knowing more details of her situation I can’t say if those alternatives are available in your case. I’m also not clear on if she was awarded the car you mention in the divorce, which would mean you are asking about a second car. If you are asking about a second car, the vehicle with the lesser equity would count towards her $2,000 asset limit and may present its own problems in that context. If your goal is nursing home Medicaid, it is usually a good idea to have experienced advice before undertaking transactions with someone else’s money that may trigger unintended consequences. The car was awarded in the divorce, there is no second car. Thank you for your advice.